Awarded at the Australian Open Fencing Championships to the Australian state or visiting international team with the most points. The Cyclone Cup was donated by Boral Cyclone Limited to the Australian Fencing Federation Inc. This Award seeks to continue the existing Cyclone Cup policy and procedures. Awarded at the Australian Veteran Fencing Championships to the Australian state or visiting international veteran team with the most points. The Centenary Shield was donated by the ACT Fencing Association to the Australian Fencing Federation Inc. in 2013. This Award commemorates the Centenary of foundation of both the Australian Capital Territory and the Fédération Internationale d'Escrime (FIE) in 1913. Presented to the state whose fencers are most successful in national Under 23 competitions held in conjunction with Australian Fencing Circuit events. The Charles Stanmore Trophy was donated by NSW coach and fencer Richard Emmerick in 2016. It is named after an Australian Olympic fencer and coach. At the 1952 Helsinki Olympic Games, Charles Stanmore represented Australia in individual epee and was a member of the Australian men’s team in all three weapons. At the 1950 Empire Games (now Commonwealth Games) he was a member of the gold-medal winning Australian men’s epee team. He coached the Australian team at the 1962 Commonwealth Games. He died in 2012, aged 88. Charles Stanmore studied fencing prior to the 1952 Olympics with Mangiaroti, Pinotti, Perone and Mossbaum. At home, he re-started the Sydney Fencing Club and coached many successful fencers, including Greg Bailey, Bob Barrie, Melodie Coleman, Ann Darragh, Richard Emmerick, Jeff Gray, Ivan Lund, Jacqui Mansfield, Roger Stanmore, Leon Thomas and Len Traynor. Several of the fencers he trained became coaches – Greg Bailey, Bob Barry, Richard Emmerick, Jeff Gray and Leon Thomas – so the legacy of Charles Stanmore lives on. Awarded at the Australian Junior Fencing Championships to the Australian state or visiting international team with the most points. The E. J. v Szekall Cup is named in Honor of Endre Joseph (Andy) Szakall and was presented by the Victorian Amateur Fencing Association and the Council of Hungarian Associations of Victoria to the Australian Fencing Federation. Endre Joseph (Andy) Szakall was known as "Mr Fencing" in Australia for many years. Andy was one of three post-war Hungarian refugees employed by the Victorian Railways who provided the impetus for forming the VRI Fencing Club in Melbourne in 1949. Andy had fenced in Hungary in the pre-war period, but he relinquished the opportunity to represent his new country at the 1956 Melbourne Olympics, choosing to become the Fencing Team Manager for Australia instead. Andy was coach and manager of Australian Olympic fencing teams from 1956 to 1972. He was chief organsier of the fencing events at the 1966 World Pentathlon Championships and head of the organsiing committee for the Fencing World Championships held in Melbourne in 1979. Andy became VRI Fencing Club's Honorary Secretary and Instructor and remained active with the club until his death in 1988. During his coaching career, he produced multiple Australian Junior and Senior, Oceania and Commonwealth Champions. He was one of the main drivers behind the introduction of the Australian Junior Championships in 1965. Many of his pupils represented Australia at World, World Junior and Commonwealth Championships, whilst some became Olympians: Christine McDougall, Ernie Simon, and Helen Smith. Andy was a brilliant administrator and a visionary who dared to undertake a range of projects that drove the development of Fencing in Australia. He was responsible for the successful staging of the World Fencing Championships in Melbourne in August 1979. He served as President of the Victorian Amateur Fencing Association for twenty years, President of the AFF for 4 years and as Secretary General for 17 years. He was Australia’s delegate to the FIE for many years, was a member of an FIE Commission and Secretary-General of the Oceanic Fencing Confederation since 1969. He was awarded Life Membership of the VRI Fencing Club, the Victorian Amateur Fencing Association (now Fencing Victoria) and the Australian Fencing Federation for his dynamic and dedicated services to his beloved sport. In 1980 he was awarded the Medal of the Order of Australia (OAM) for services to the sport of Fencing and was recognised as a Membre d’Honneur (Member of Honour) of the International Fencing Federation (FIE) in 1984. Awarded at the Australian Cadet Fencing Championships to the Australian state or visiting international team with the most points. The Janet Hopner-Haswell cup was presented by Janet Hopner-Haswell to the Australian fencing Federation in 2004. The cup is for the annual perpetual competition between the Australian state teams during the Australian Cadet Fencing Championships. The cup is named in Honor of Janet Haswell. Janet was NSW Women's Foil Champion, (1962,1963,1964,1972,1975), Australian Women’s Foil Champion, (1962,1963,1964), Bronze Medallist British Empire and Commonwealth Games (1962), Olympic team member and Women's Foil Team Captain at the Tokyo Olympics, (1964) and came 10th Women’s Foil, Inaugural World Master's Games, Toronto Canada 1985. During her 10 years of coaching, she coached many juniors who between them won approximately thirty school, state and national individual and team championships. Janet’s first pupils were her two daughters Dione Vosper and Adele Haswell who continued on to have success at State, National and International levels. In 2001 Janet was awarded Honorary Life Membership, Australian Fencing Federation - “In recognition of an outstanding contribution to Australian Fencing”, and also Honorary Life Membership, NSW Fencing Association Inc.
Janet Haswell (nee Hopner) has had over 60 years of involvement in fencing from her days of competing to other roles including Coach, Mentor and Sport Psychologist. - Club president, Club delegate to N.S.W.A.F and A.F.F. - Public relations, (gala displays, television interviews, demonstrations. - Photographic montages, media liaison, publicity reportage. - Main artwork design and execution of original state wall pennants. - Design artwork for club T-shirt and competition pennants. - Ten years coach plus ongoing mentor. Awarded at the Australian Under 15 Fencing Championships to the Australian state or visiting international team with the most points. 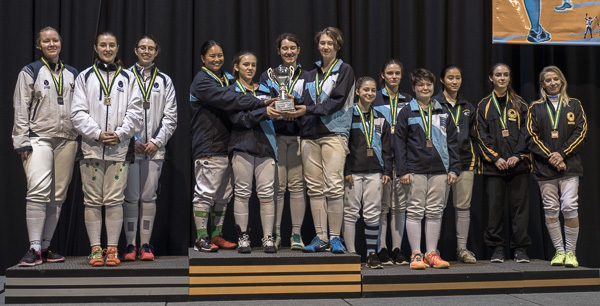 The Frank Bartolillo cup was presented to the Australian Fencing Federation in 2015. The cup is for the annual perpetual competition between the Australian state teams during the Australian Under 15 Fencing Championships. The cup is named in Honor of Frank Bartolillo. Frank completed an outstanding international career culminating in Olympic Selection for Athens 2004. He excelled at age and open events. In his first World Cadets he made the top 32, placing 23rd in both foil and sabre. His best age result was a spectacular top 16 in Cadet Sabre. At Senior World Championships Frank achieved a career best top 16 result in 2007, together with a number of top 64 results, several top 32 ‘s and a top 16 in World Cups. Frank achieved an FIE Senior ranking of 45 and a FIE Junior ranking of 25. Frank reserves a special place for the Commonwealth Championships. At age 18 he won Bronze in Team Sabre. In 2002 he became Commonwealth Foil Champion and was a member of the team that took Gold. Though retired from competition in 2008 when Australia hosted the 2010 Commonwealths Frank decided to make a comeback. He undertook eight months of serious training including a training camp in Singapore with the top two British fencers, Frank again won the title of Commonwealth Foil Champion and again was a member of the winning foil team. U/15 7 including School Boys and State Champion. U/17 4 including School Boys and State Champion. U/20 8 including State Champion. Open 18 including 4 times State Champion. Frank’s success is attributable to a dedicated team. With the guidance of his first coach, Tristan Chan, Frank won his first Gold Medal at age 12 in the NSW Schools League and went on to secure the triple age Australian crown. On Tristan’s retirement from coaching, Frank undertook the training program planned by Al Wardle, Master of Arms FIE, Sydney & Athens Olympic foil coach culminating in Olympic Qualification. Ivan Zhao accompanied Frank to Senior World Championships . These perpetual trophies are awarded annually to the winning team in the relevant weapon at the Australian Open Fencing Championships. 2018 New South Wales "A"
2015 New South Wales "A"
2007 New South Wales "A"
2006 New South Wales "A"
2016 New South Wales "A"
2013 New South Wales "A"
2011 New South Wales "A"
2010 New South Wales "A"
2008 New South Wales "A"
2005 New South Wales "A"
2004 New South Wales "A"
2003 New South Wales "A"
1997 New South Wales "A"
2017 New South Wales "A"
2014 New South Wales "A"
2012 New South Wales "A"
1994 New South Wales "A"